The North East CMA has produced a Promotional folder designed for Landcare groups to provide to new members or to handout at events. The folder is designed to take A4 size documents, flyers and information, plus a business card. There is plenty of room for your Landcare group to add your logo to the folder and to fill with information about your group. Groups can use these to provide to new landholders in your area, or available at stalls and promotional events. Call into the Wodonga CMA office to pick up your free copies today! Otherwise, we can arrange to have copies dropped off to a nearby location. While you are here there are other brochures such as the Small Rural Property Guide and general Landcare flyers that would be great additions to the folders. 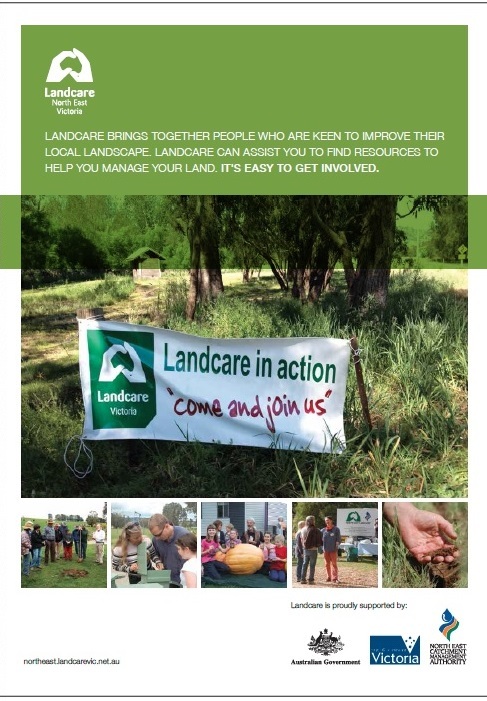 In addition, there is a Landcare Flyer template available. This is designed to allow groups to enter their group name, logo, contacts and general information on group activities, for general mailouts, or to include in the folder. For more information or to request your copies, please contact the CMA.